An idea for the new blog may pop up at any time. You might proactively think about it, or the idea for a new blog may come up to you while you’re talking to a friend. But when you decide to implement the idea into a real project, things will start to get more complicated. Let’s say that you don’t have to think about the platform you’re going to use to power up your blog because you decide WordPress was the best one for you. Still, you will have to find a theme, customize it or decide to build one from scratch. You will definitely need some plugins; choosing the best ones (among many built for the same purpose) is a daunting task by itself. But setting up all the plugins you will need, personalizing them and getting an entire functional site from the items you choose will definitely take time. Even if it’s not your first blog that you’re building. Because all of that, you should think about starting out with a coming soon page. What’s a coming soon page? Coming soon page, also known as under construction, is a simple page that’s showcased to the visitors before your website/blog is complete. Instead of letting your first visitors see incomplete work, you get to let them know that you’re still working on the site. Such a page will help you hide broken elements and issues until you’re one hundred percent ready to show your website to the public. Coming soon page is also good for marketing purposes. Even if your website isn’t done, you can show off your brand, and start connecting on social media. You can even collect emails or display a few images that may represent you or your product. So, if you want to build for yourself, let us show you the best way to do it in WordPress. Like with almost everything with WordPress, there’s a plugin that will take your worries away. With more than 130,000 active users, the UnderConstructionPage plugin is one of the most popular solutions. It doesn’t surprise to see that this plugin has been downloaded almost one million times. Let us show you why it is so popular. Since you will have to spend some time on preparing your actual site, there’s no need to waste hours on generating an under construction or coming soon page. 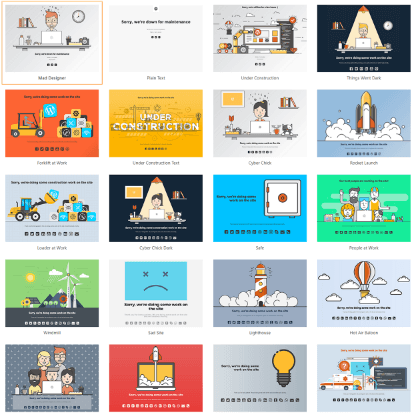 So, instead of coding and drawing, UnderConstructionPage plugin throws more than twenty-five awesome designs in front of you. Just by selecting the one you like, your coming soon page will be ready. Still, you can change a thing or two with custom CSS. If you have a known brand or would like to set a specific tone with some custom colors, you can personalize the entire page through a few lines of CSS. By choosing a design, you set up the environment. But before launching your coming soon page, you should write something and organize the content. Whether you decide just to write a headline or you have more to say, everything’s available with a click of a button. Write, add images, and videos and you’re done. If you’re really in a hurry, you don’t even have to change a thing – the plugin will still show the default coming soon messages for you. You still don’t have a live site. That’s ok, you’re working on a coming soon page. But that doesn’t mean that you should have social media profiles. Whether you have Facebook, Twitter, Instagram or any other social media account, you can quickly connect it to the plugin. Just choose which icons you want to display, enter the URLs and the plugin will do the rest. It will place the social media icons on the bottom of your coming soon page so that visitors can get in touch with you more easily. Free plugins don’t usually have quick support. But UnderConstructionPage makes the difference. 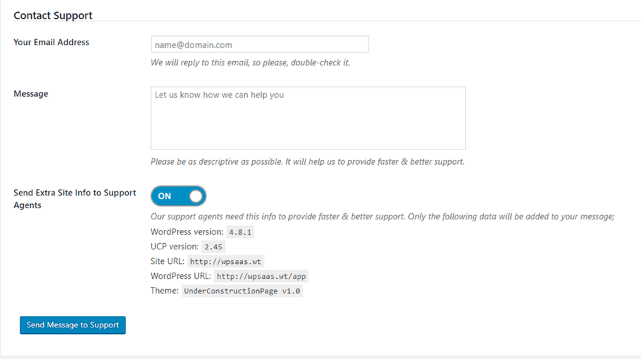 Instead of waiting for days to get answers, the developers have placed a contact form directly into the plugin. So, if you have any questions or some features don’t work for you, leave a message and you’ll get an answer from the developer within a few hours! Amazing! By default, admins get whitelisted. What does that mean? All users, except the admins, will see the coming soon page, but the admins will still be able to work on the site like nothing happened. UnderConstructionPage plugin gives you control over this so you can whitelist any user role you want. It’s even possible to whitelist specific user by writing his or her username in the settings. This is a feature you must have when working with a friend or for a client. Once you are done with choosing a design and writing content, there’s one more button you will be interested in. By clicking the “On” button from the plugin’s settings or the admin bar, you will launch the coming soon page. That means that from that moment, anyone but you (the administrator) will see the coming soon page instead of the one that you’re working on. You can even schedule the start of the under construction mode by writing the start date. Everything described is available for free. Just download the plugin from the repository, install and activate it. But you should know that the plugin comes in the PRO version as well. Meaning you can have a full page builder with a dozen of elements. You get to work with more than 400,000 free images. You get improved access control, and even custom URLs you can build just for your clients. MailChimp, Zapier and any other autoresponders are ready for you in the PRO version as well, and embedding a contact form is a piece of cake. You get to use Google Maps, and it’s good to know that the PRO version allows you to use any 3rd party shortcode. How do you like the UnderConstrucitonPage plugin?